Started this morning with a 10 mile descent down a cyclepath into Ashbourne. 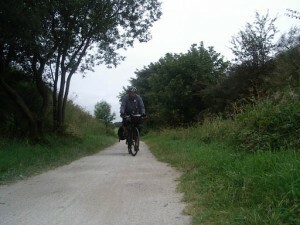 The cyclepath was excellent. I knew at any moment it would throw me out onto a main road but it didn’t. It kept going right into Ashbourne. There’s a tunnel at the end of the path and then you’re in the centre of town. Ashbourne was followed by 35 good country miles – the countryside was very like Somerset where we did all of our training. Then Tamworth. Tamworth was a complete change which big roads and roundabouts. Did the old trick of missing the exit at least once and heading off down a dual carriageway that I didn’t want to head down. Found my way out in the end though. GPS did something very strange after Tamworth. Heading off along the road, minding my own business it started to try to convince me I was elsewhere. Nearly had me convinced too – I turned around and set off back the way I had come until I found the track again and retraced my steps. Did the same again. I ignored it this time, and when I passed the petro-chemical works it settled down again. After this there was more countryside until Kenilworth. From here it was busy up to Warwick, then more nice countryside all the way to Stratford. Very good day.